I (Cathy) am currently working my way through a book on critical reflection. ‘Working’ is the operative word, as this book, What Our Stories Teach Us, is set up as a guide to take us ( the teacher, professor, etc.) 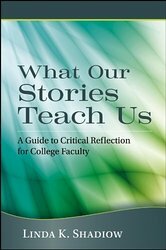 through an active critical analysis of our lives as educators using storying and critical incidence. The author, Linda Shadiow, loves to share stories herself. Below is one of her favourites. Apparently she has told it often and she uses it in her book to illustrate how our stories can impact our lives. The graduate student is, of course, Shadiow. She explains in her book that her experience with Freire never left her. It energized and motivated her. She had to “give back “. She invites us as both reader and participant to rediscover our incidences of profound learning and let them move us.